Football news and forum site Football365 has posted an open letter to the Sun, criticising the paper’s back page lead yesterday on England manager Fabio Capello. Our fear is that this campaign is being waged not because the tabloid press truly believe that Capello is in the wrong (…) but largely out of spite because they didn’t get their way after the summer and he stayed on. The site is of course part of the 365 Media Group, which is owned by BSkyB, part of the Murdoch empire that also includes the Sun. This entry was posted in Editors' pick, Newspapers and tagged Fabio Capello, football, football365, sun, The Sun on August 26, 2010 by Laura Oliver. Bournemouth Echo sports editor Neil Meldrum says the paper “will not be held to ransom” by Southampton Football Club, which recently announced plans to ban press photographers and syndicate the club’s own photographs of the team’s home matches. Mr Cortese [executive chairman] clearly thinks his club will make a buck or two by syndicating pictures taken by their own man. I’ve got news for you, Nicola: You won’t. This entry was posted in Editors' pick, Newspapers, Photography, Press freedom and ethics and tagged bournemouth echo, football, nicola cortese, Photography, Southampton, southampton fc, sport on August 11, 2010 by Laura Oliver. 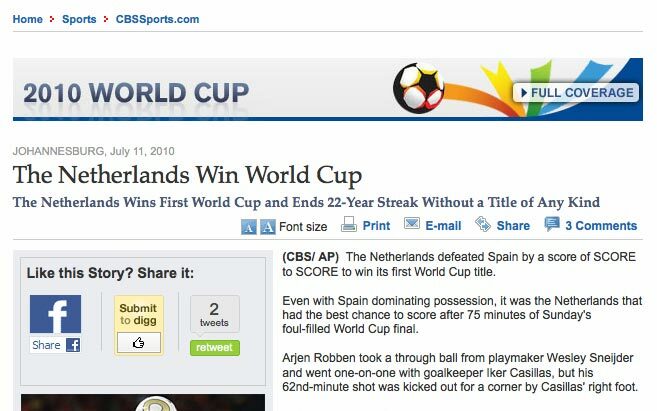 This entry was posted in Online Journalism and tagged CBS, football, world cup, worldcup on July 12, 2010 by Laura Oliver. England fans might be desperately trying to sell on their World Cup tickets, but there’s still time to join a Mexican wave in support for the remaining teams playing in South Africa. Join the mother of all Mexican Waves with BBC Radio 5 Live for 2010 World Cup! Dizzee Rascal, Miley Cyrus & Richard Hammond are in, are you? To be included, users upload need to upload a photo as described at this link. This generates a Mexican Wave video containing the user’s photo, and photos of Radio 5 live and Radio 1 presenters and celebrities; the user will also be included in the 5 Live Mexican Wave. There’s a rumour we’ve got the godfather of radio, Mr @terry_wogan to do a #bigmexwave. Watch this space! This entry was posted in Broadcasting, Handy tools and technology, Social media and blogging and tagged BBC, big mexican wave, football, Radio 5 Live, world cup on June 30, 2010 by Judith Townend. Hmmm. I am in Soccer City, the North Koreans are at Ellis Park across the City. I have only a couple of hours to kick-off, no North Korean contact – but then, who has? – and no ideas, except for simply standing outside the ground and waiting for a North Korean to arrive. This is not time quibble because the message from the newsdesk is that this is a “must-have” story. Foreign correspondents in South Korea and Japan are filing dispatches and Jonathan Clayton, our correspondent in Johannesburg, has been stationed outside the team hotel. I have 800 words to write on the mysterious North Korean fans. Oh dear. Times reporter Kevin Eason gives a great, first-hand account of tracking down stories – and North Korea fans – at the World Cup. It’s a story of shoe leather, pressure and a little bit of luck as a reward for doggedly chasing leads. Would be interesting to know if any World Cup reporters are using social media shoe leather too? 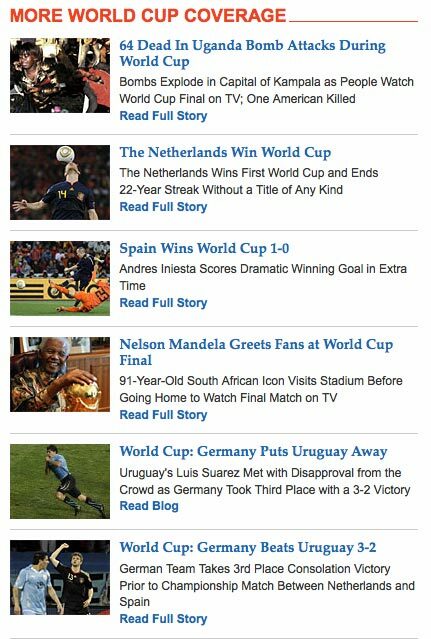 This entry was posted in Editors' pick and tagged football, kevin eason, sport, sports journalism, The Times, times, world cup on June 21, 2010 by Laura Oliver. Before social media created a two-way conversation on the internet, a journalist would only have had their editor and probably the manager of the club they reported on to answer to. They could print stories knowing they would not be asked to justify them to the ordinary football fan. But it’s different now for those who have chosen to set up Twitter accounts. They are pulled up on any factual errors in their stories, asked to reveal their sources and generally badgered by their followers (…) it’s a great way of taking the temperature of a club’s fans. You get to understand how they feel about certain players and managers, and what they believe are their biggest issues and concerns. Of course, journalists should probably know this kind of thing but you can sometimes get caught up in the bubble of press conferences and talking to colleagues, and not realise what the real problems are. This entry was posted in Editors' pick and tagged football, sport, sports journalism, Twitter, when saturday comes on June 8, 2010 by Laura Oliver.